Media captionCharlotte Brown's sister Katie says Jack Shepherd has shown "unbelievable arrogance"
The family of a woman who died in a speedboat crash on the Thames believe her killer showed "unbelievable arrogance" when he appeared on TV. Jack Shepherd went into hiding in Georgia before a trial where he was found guilty of the manslaughter of 24-year-old Charlotte Brown. Ms Brown's sister Katie said her family felt "increasingly angry" after he told reporters he was innocent. Shepherd is expected to make his first court appearance in Tbilisi on Friday. 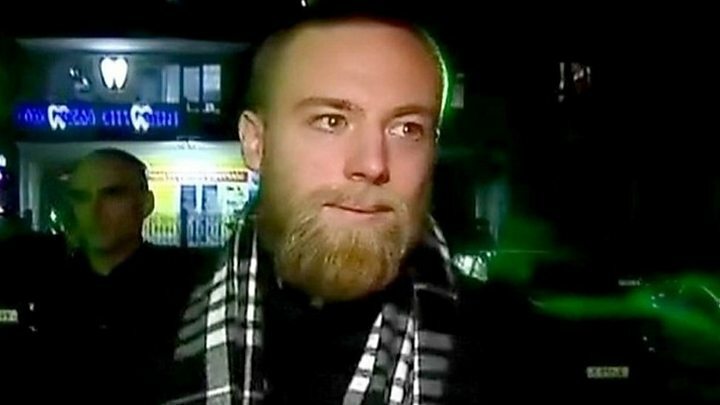 He told a Georgian TV channel he hoped "justice will be done... and that everyone can move forward with their lives", before handing himself in to police in Tbilisi. But Ms Brown said she believed her sister's killer had given himself up "for purely selfish reasons". "All he's thinking about is himself and his feelings," she said. Shepherd's lawyer confirmed the 31-year-old will appear at Tbilisi City Court at 13:00 local time (09:00 GMT) on Friday. While the family were "relieved" to see Shepherd in custody, Ms Brown said they felt "shocked" to see him "just stroll into the police station smiling and waving, it was unbelievable arrogance". "Whilst he's been off in Georgia, he claims that he went to see friends and he has always wanted to see the scenery there - almost like he was claiming it was a holiday. "He is not thinking about Charli, us, respect for the legal system, all he is thinking about is himself and his feelings," Ms Brown said. Shepherd was sentenced in his absence to six years jail in July for the manslaughter of Charlotte Brown. They had met online and on their first date on 8 December 2015, the pair had dinner then went on the web designer's speedboat. They were both thrown from the boat near Wandsworth Bridge at about midnight. Shepherd was found clinging to the hull while Ms Brown, from Clacton in Essex, was pulled from the water unconscious and unresponsive. In his TV interview, Shepherd said UK authorities had "rightly" treated the crash as an accident initially, but "after significant pressure by her father, the police decided to prosecute me for manslaughter". However, Graham Brown told the Victoria Derbyshire programme that was "very misleading and inaccurate". "It was totally out of my control. The CPS [Crown Prosecution Service] made the decision to get the case reviewed, because of its complexities, by the serious homicide squad," he said. The CPS said it was "not accurate that we ever made a decision not to charge Mr Shepherd" and it was "not unusual to instruct Queen's Counsel to provide advice". Tariel Kakabadze, Shepherd's lawyer in Georgia, said his client was "extremely sad" about Charlotte Brown's death but believed he was innocent. Shepherd is currently being held in a pre-trial detention centre ahead of his court appearance. Speaking about whether Shepherd will contest extradition, Mr Kakabadze said he would "discuss it with my client... after we carefully study all the possibilities and options". BBC correspondent Rayhan Demytrie said the process was expected to take "several weeks" because there were numerous formalities involved with it. Don't be surprised if Shepherd is not chalking up the days of his sentence in a British cell for some time to come. If Shepherd were in an EU state, the European Arrest Warrant system would have seen him bundled onto a plane almost as fast as it takes anyone to read the 599-page Brexit withdrawal agreement. Georgia, not being an EU state, is a signatory to a secondary and far slower international extradition deal. While it is by no means as efficient as the EAW, it at least sets out the principles of how to proceed with the UK's request for Shepherd's return. British diplomats will confirm what documents Georgia's judges need to see from our prosecutors and courts - that's expected to be a legal explanation of what Shepherd was accused of and an account of his trial and conviction. Manslaughter is is an internationally-recognised serious crime - so the UK's request for the return of a killer should be automatically recognised as valid, in the same way that such a request from Georgia would be acted on. It's then down to how long Georgia's courts need to reach a final decision, including considering any appeal that Shepherd mounts. So things will take a little longer - and possibly a lot longer if he tries to convince a judge that a man who went on the run from his own trial is a victim of an injustice. The CPS is currently drafting an extradition request to bring Shepherd back to the UK. The British Embassy in Georgia said authorities from both countries were "cooperating closely" over the case. Under the terms of extradition from Georgia, a person "shall be extradited to a foreign state for such crimes that both under the legislation of Georgia and that of the foreign state concerned are punishable by at least imprisonment for one year or by a stricter punishment". "In the case of a convicted person, it is necessary that the person be sentenced to at least four months of imprisonment."